Writing a graduate level personal statement just like an admission essay Uganda or personal statement UK isn’t easy. Sometimes you lack inspiration and need a fresh idea to continue writing. 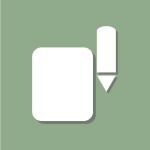 Our writers give you such an opportunity and offer to review the sample provided below. For countless college graduates obtaining an MBA is the first step needed to take if he/she is sincerely seeking a career in the business world. I, however, am seeking an MBA for different reasons, as I already have an established career and a great deal of work experience. I am seeking to obtain my MBA with a concentration in human resource management, to help me become a better-rounded manager, leader, and team player. Additionally, I am pursuing my MBA at this time, as I feel it a responsibility I need to follow through with myself, and a commitment I need to make to my fellow co-workers.I feel obtaining my MBA is a responsibility I must follow through with for myself, as I am a very proactive competitive person who is always striving to push my personal limits. I firmly believe pursuing my MBA at this juncture in my life is not only the next logical step towards advancing my career but also the next challenging step I need to push myself to become a better professional and individual. I also feel this is a great commitment to my co-workers, as I want to set the example for others and display to them that it is never too late to attain one’s dreams. I also feel strongly it is my commitment and responsibility as a woman to show other women, especially those who follow after me, that women are strong, independent and can shatter glass ceilings with enough determination and effort. I strongly believe I am ready, and adequately equipped with my professional background and education, to continue my business education. It is with great humility I seek admittance into your school and MBA program. Upon acceptance into your program, you will, in turn, be receiving a very driven, motivated and passionate individual who is willing to stop at nothing to meet her goals. I thank you greatly for your time and consideration and look forward to speaking with you about my acceptance further. Learning how to come up with a great personal statement for graduate school is far from an easy thing, in fact, it can be the hardest part about formulating your application overall. This is largely because the personal statement asks so much that it’s easy to get overwhelmed and struggle to come up with the results that you are asked to. This is what makes so many people struggle with personal statement editing, but help is on the way. 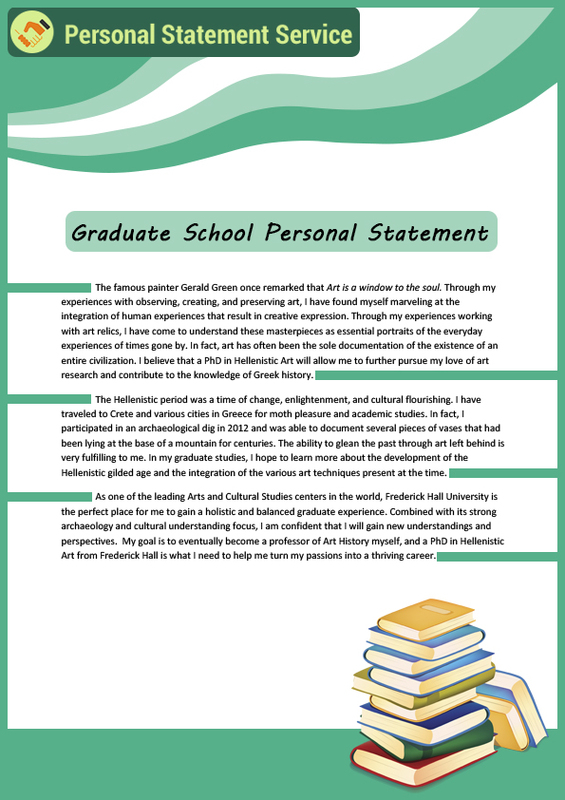 There’s no better method for learning than simply seeing something in action, and that’s what a professional sample personal statement for graduate school from us can do for you! Many people turn online to get a personal statement graduate school sample, but it’s important to remember that the place you get it from is hugely important as well. If you don’t get your sample personal statement for graduate school from a source that you can trust, then how can you trust that it’s accurate and that you will learn the right things by perusing it. What you need it a sample from a source that you know is reliable, and there’s no better source for this than us. Each sample personal statement for graduate school on our site is written by experienced and capable professionals who are dedicated to providing you with all the proper assistance and resources that you need to be successful. 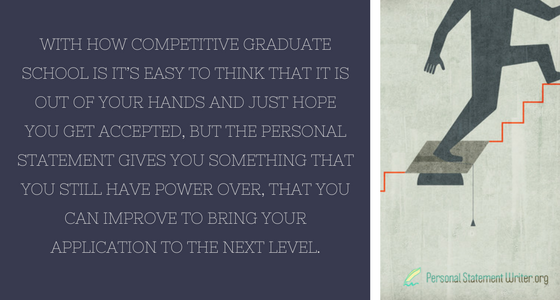 With how competitive graduate school is it’s easy to think that it is out of your hands and just hope you get accepted, but the personal statement gives you something that you still have power over, that you can improve to bring your application to the next level. This is what our professional personal statement revision service is here to help you accomplish, to take your personal statement and turn it into something that can make a real difference in determining your success! Applicants who are currently writing personal statement graduate school material are sometimes not aware of the burden that they’re under while writing it. At other times they’re actually so aware that they’re starting to panic. In either case, it’s best just to ask for a little help. The process is extremely important, and it’s really one of the biggest hurdles to getting into a final graduate school program. On the other hand freaking out isn’t going to help one bit, so please do let cooler heads prevail. We’re here to help. Writing a personal statement for graduate school can be exciting, but it can antithetically actually be quite dull. While this is supposed to be an opportunity to show other people what sort of student one is, the personal statement for graduate school actually has a number of formal as well as unwritten rules that govern the way that it’s supposed to be handled. That’s made the average personal statement graduate school come off a certain way. Indeed, the vast majority of them read somewhat alike. As a result, students are sometimes unable to differentiate themselves from one another when it comes time to face the review board. Each page sounds the same, and many of them mention the same books if they’re supposed to reference a particular piece of writing. By getting professional assistance with the writing a statement can really stand out, especially since our organization hires college-educated native English speakers who are ready to work on even obscure styles of prompts. Writing a personal statement for graduate school or MBA application personal statement isn’t necessarily a fun task, but our service can make it a good deal easier. Since students often apply to more than one graduate program they’ll need more than one statement. It’s easy to order rewrites of the same material, and students will be pleasantly surprised to note that we never duplicate content or do anything else that’s indiscreet. 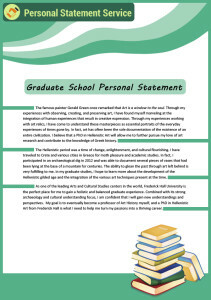 Follow our sample personal statement for graduate school or order one for yourself today!